I thought these were so cute, I had to share them with you. A few days ago my mom made these delicious stuffed peppers. Normally she goes on about how she's not a good cook, but these turned out great...way to go mom, I'm proud of you! Stuffed with couscous, mushrooms, zucchini, raisins, ground beef, and mozzarella, these gorgeous peppers are really a complete meal, all bundled up into individual-sized packages. Mom thinks blog recipes are great, because a "real person" has cooked with them. In her reasoning, if they can do it, she can do it. So she found a stuffed pepper recipe online, then tweaked it with some Italian inspiration from her Aunt Diana. And this is the amazing result! Actually, when comparing what she did and what the online recipe states, she pretty much made her own recipe. She totally underestimates her abilities as a cook! Since my mom eyeballed a lot of the measurements, she could only give me a rough sketch of the recipe. But I've tried to tighten up the ingredients list and hope you find it inspiring next time you play around with peppers in the kitchen! Cut off the tops of the peppers to make lids and set aside; scrape out the seeds and discard. 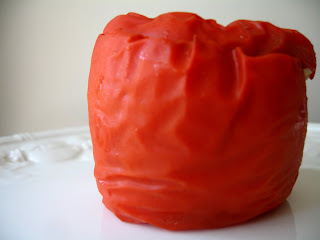 Place bell pepper cups cut side up on a steaming rack over an inch of water in a large covered pot. Bring to boil, let steam for 10 minutes. Heat the olive oil in a large pan and saute the garlic and onion until translucent. Add the zucchini and mushrooms and continue sauteing until vegetables are cooked. 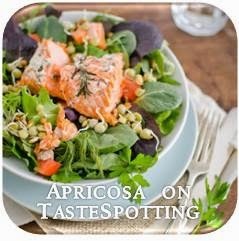 Transfer vegetables to a large bowl and toss together with the remaining ingredients, seasoning to taste with salt and pepper. 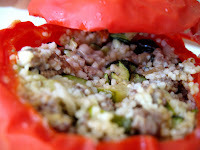 Fill peppers with the couscous mixture and cover with reserved pepper tops. Place stuffed peppers in a lightly-oiled oven-proof casserole dish and bake at 350°F on the middle rack for 25-30 minutes. Wow, these look great. 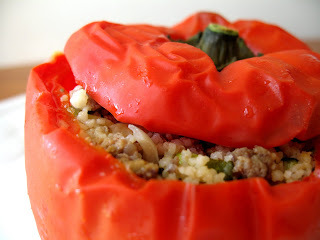 I love stuffing peppers with rice and ground beef. The color of this pepper is breath-taking! Thanks for sharing. I love that you and your mom connect through food! My mother will try new things in the kitchen, although she prefers her "tried and true" recipes, but searching for recipes on the Internet?! Now that would probably be asking too much. What a great recipe she (or maybe I should say, the two of you) came up with. And I agree with her...I'll be more likely to try it, knowing that there's a "real person" behind it. Thanks for sharing. Sophia - thanks for stopping by and visiting! Yes, aren't stuffed peppers yummy? Lovely Blog - have just mixed the sponge for Pane Toscana, so looking forward to that tomorrow and these peppers next week! Thanks!